"You are a monster, Nidhiki. Matoran seeing you would run screaming. You will never be cheered, never be admired, never be hailed as a savior by the crowds. What are you now? A Toa of Nightmares? A hero, Nidhiki, or a horror? No, I think you will find your place is now, and forevermore, with the Dark Hunters. For who else would have you?" Nidhiki was a Le-Matoran native to the Tren Krom Peninsula and later became a Toa Mangai of Air. He defected to the Dark Hunters during the Toa-Dark Hunter War and was mutated into a large insectoid creature. He was ultimately killed when he was absorbed into Makuta Teridax's essence. During the Toa-Dark Hunter War, Nidhiki was assigned to protect Turaga Dume, though he grew bored with guard duty and slipped out, joining Lhikan on his rounds. While searching Ga-Metru by himself, Nidhiki was confronted and cornered by the Dark Hunter Lariska, who proposed that Nidhiki betray the city in exchange for a leadership position in it. Tempted by dreams of conquest, Nidhiki agreed to lead the Toa into the ambush so the Hunters could win the war. Lhikan sent Nidhiki to meet some supply boats the next night, but Nidhiki left without hearing where, and instead met with Lariska and completed their agreement. Nidhiki was responsible for preparing a team to capture the Makoki Stone from a heavily defended fortress. He got easily bored with training the team, and was especially annoyed with one trainee, Krekka. He later met with the Shadowed One, who decided to send him on a mission with a partner. Nidhiki was convinced that it would be Lariska; however, the Shadowed One instead paired him with Krekka. With Lariska acting as reconnaissance, their first mission was to steal three prototype launchers from a Matoran village on Nynrah. Lariska went ahead to distract the Toa there, while Nidhiki and Krekka retrieved the launchers. Nidhiki wanted to bring one to the Shadowed One and keep the other two for himself, offering one to Krekka as a bribe. Krekka threatened to turn him in, however, and Nidhiki was forced to give all three to the Shadowed One. Nidhiki and Krekka made another attempt to capture Nokama, Vakama, and Matau in Po-Metru, but were stopped by a stampede of Kikanalo. Afterwards, Matau used his Mahiki to fool the pair into following and attacking each other in the Canyon of Unending Whispers. Later, the two assaulted the Toa Metru's Vahki Transport, but Onewa used his Mask of Mind Control to make Krekka attack Nidhiki. The pair fell off the transport and Nidhiki was caught by Teridax's Shadow Hand, together with Krekka and Nivawk. Teridax absorbed their essences, killing them, in order to fuel his own transformation. [BA4] As a result of perishing in this fashion, Nidhiki could not be revived in a new body aboard the Red Star. As a Toa, Nidhiki had control over the Element of Air. After his transformation into his mutated Dark Hunter form, he gained the ability to launch Kanoka from his mandibles, although he lost his elemental and mask powers. He could fold in his legs and fly, and shoot force bolts. During the transformation, his hands were replaced with large claws. As a Toa, Nidhiki wore emerald green armor and carried an Air Scythe, which allowed him to focus his Air powers. He also wore a green[OGDi: May 21 2008, 10:42 PM] Volitak, which allowed him to move almost unseen and completely unheard. 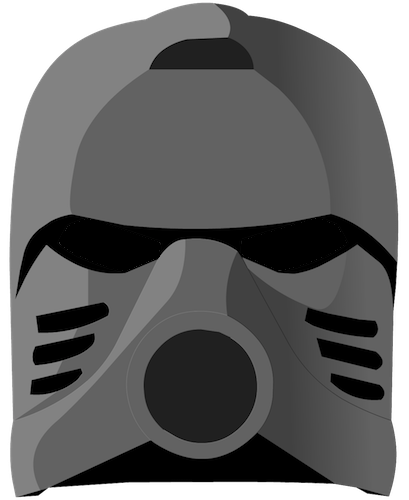 His Kanohi Volitak was fused to his face when he was mutated, and he lost access to its powers. 8622 Nidhiki was released in 2004. He contained 170 pieces including an Onu-Metru Kanoka disk. His head, identical in construction to that of a Vahki, could fire Kanoka disks from its mandibles, and each of his claws could snap open or shut using a switch near each elbow. His legs could fold up against his body and his body could fold back, rendering his shape thinner and flatter. This symbolized his ability to fold up for flight. Nidhiki's parts could be combined with those of 8621 Turaga Dume & Nivawk to construct a Lohrak using instructions included in a 2004 LEGO Magazine. Nidhiki could also be combined with 8623 Krekka and Turaga Dume & Nivawk to create the form of Teridax known as "Ultimate Dume", whose instructions could be found in each component's instruction booklet. Nidhiki's parts and instructions were also included in the 2004 special edition set, the 10202 Ultimate Dume, exclusive to Toys "R" Us. "You are so trusting, so convinced of the purity of Toa. I don’t think Nidhiki even trusts himself. Better keep an eye on him, Lhikan, he’ll come to no good." "You take all the fun out of constant violence, Lhikan." "A friendly place we have here. Heavily defended, home to several hundred killers, and unfailingly lethal to trespassers, but friendly." "This time, your farewell will be forever, brother." "You lost the right to call me brother long ago!" "I see you have spirit, little Toa. I hate spirit." "You think you can save Metru Nui, little flame? You are just a Matoran with delusions of adequacy." Nidhiki and Krekka were given the Rahi Nui by Teridax as a tool to use against Toa. Nidhiki was voiced by Paul Dobson in Legends of Metru Nui. This page was last edited on 17 October 2018, at 19:02.